San Diego political, religious and education leaders quickly slammed President Trump’s decision Tuesday to end the DACA program, potentially leaving nearly 40,000 young people in San Diego subject to deportation. “By ending DACA, President Trump ignores the Dreamers’ economic impact to our country. He has not only put them at risk, but our economy at risk as well. While it’s sad that Trump is siding with the worst elements of his administration, it’s not surprising given his past rhetoric on immigration,” said Rep. Susan Davis, who represents the 53rd District in San Diego County. The program, instituted by President Obama in 2012, allowed undocumented immigrants brought to the United States as children to receive two-year permits to legally work or attend school. Some 800,000 nationally, 200,000 in California and 38,000 in San Diego County are covered by the program. Atty. Gen. Jeff Sessions announced the administration’s plan to end the Deferred Action for Childhood Arrivals program after six months, saying that would give Congress time to act. However, it’s unknown if enough Republicans will join the Democratic minority to save the Dreamers. Under what Sessions called an “orderly and lawful” phaseout, those currently protected can stay in the country until their two-year permits expire. No new applications will be considered, but permits expiring between now and March 5, 2018, may be renewed. But Rep. Darrell Issa, a Republican, said DACA was only a “band-aid” and Congress needed to provide permanent protection for the Dreamers. He promised to work with Democrats on a legislative solution. “The administration’s decision today puts the onus on Congress to address this challenge in the right way: for the long-haul, with respect for our nation’s laws, a desire to enhance the integrity of our borders, and a sense of compassion for those who were brought here in their childhood years ago and wish to stay as productive members of our communities,” said Issa, who represents north coastal San Diego and south Orange County. 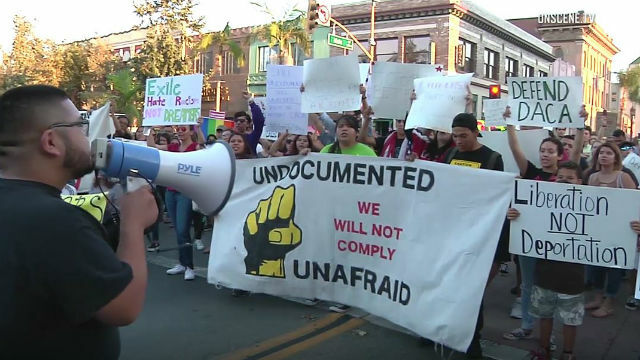 San Diego Unified School District Superintendent Cindy Marten said the DACA program has brought thousands of talented students and teachers to area classrooms, many of whom have become doctors, police officers and firefighters.